Try this crunchy, golden and easy homemade pizza. No delivery needed! This dough is undemanding, only needs a few ingredients and will allow you to easily make your own pizza at home. I always struggle with dough, but this one is very forgiving. All you need is a bowl, some ingredients and a fork to mix everything together. That little sugar in the dough makes for an amazing golden and crunchy crust. No need to buy frozen pizzas or to call the delivery guy anymore! Crunchy, crispy and topped with molten cheese! Pizza perfection created in your own 4 walls! The dough needs to rest at a warm place. Heat your oven to the lowest setting (for example 50°c), while you make the dough. This will be the warm place where your dough will rise nicely. Measure your ingredients (with a kitchen scale) and combine everything in a bowl. Mix well with a fork. Dough making isn’t an exact science. If the dough is too dry and not all flour is incorporated, add a tablespoon of water. If it’s too wet and keeps sticking to the sides, add a tablespoon of flour. Keep going until a nice smooth ball of dough forms in your bowl. Turn off the oven, cover the dough in the bowl with a kitchen-towel and let it rest in the oven for 1 hour. (Although the oven isn’t that hot: If you are using a plastic bowl, put something under the bowl to keep it from melting to the oven!). Enjoy 1 hour of your life. Roll out the dough and make an awesome pizza! Get the risen dough out of the oven. Preheat the oven to 220°c (fan works best for a crunchy pizza crust). Sprinkle some flour on your kitchen counter. Put the dough onto it. Sprinkle some flour on top of the dough as well. Roll out the dough with a rolling pin (or a wine bottle). Dough should be around half a centimeter thin. Always roll from the middle to the outside and roughly aim for the shape of a baking tray. If the dough sticks, turn it over to take in some more flour from your kitchen counter. Add sauce and your favorite toppings. Don’t overload your pizza or it will get soggy, but don’t be stingy with the cheese either! Bake the pizza in the oven for about 15-20 minutes until nicely browned, depending on your toppings and your oven. 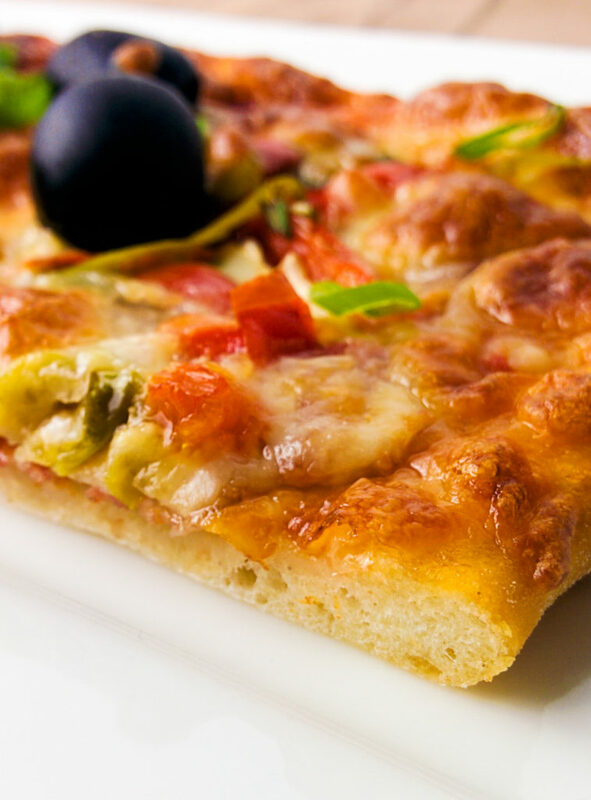 Proudly bake, share and enjoy your homemade pizza with someone! Start with a nice really-thick tomato sauce as base. The less runny the better! Add a bit of barbecue sauce for a smoky kick! Tuna, ham, mushrooms, black olives, green bell pepper, garlic and raisins (Pizza Hut on Curacao calls this one the “Curacao Supreme”). Sounds odd, but it’s delicious! Don’t forget lots of cheese – use a blend for depth! Mix drained bits of mozzarella with gouda and parmesan for perfect gooeyness and flavor! Go nuts – it’s your pizza! No judgement here! What is your favorite pizza topping combination? Like the crunchiness of my crust or think it needs to be fluffier? Think the ratios of the ingredients are off or have a better recipe for pizza dough altogether? I want to know it all! Post everything you ever wanted to say about pizza in the comments underneath!